A mail carrier in Miami, delivering a package to a house trips and falls because of a large crack in the walkway leading up to the house. A man hired to paint a ceiling in Naples is injured when part of the cracked ceiling falls. An 82-year-old woman slips and falls because of a spilled beverage in a Homestead grocery store aisle, and suffers a fractured hip. At a dinner party in Ft. Lauderdale, a chandelier falls on top of one of the guests, injuring her. All are potential premises liability claims. Legally speaking, premises liability means property owners and residents of that property are liable for accidents that have occurred due to dangerous conditions on the property. Accidents can occur either just outside or inside the property. The property can be a commercial building, private residence/rental or public property (such as homes, apartments, theme parks, stores, streets, etc.). 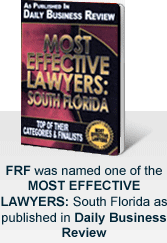 Navigating Florida’s laws can be confusing and difficult, that’s why it’s recommended that you hire an expert Florida attorney to assist in your case. Premises liability laws, in particular, can be very complicated. Causes of premises liability include poor construction, faulty design, bad maintenance, clutter and other dangerous conditions. When you are lawfully on someone else’s property and you are injured, the owner is liable for your injuries if their negligence is to blame. How do you know you have a premises liability case? First, it’s necessary to determine if you were an invitee, a licensee or a trespasser. The possessor of the property’s obligation to you can vary significantly depending on how you are classified. Invitee: An invitee is anyone invited on the premises by the possessor for a commercial purpose directly or indirectly connected with business dealings with the possessor. Licensee: A licensee is anyone invited on the premises by the possessor for any purpose other than business or commercial, with the express or implied permission of the possessor. A person invited for a social occasion is considered to be a licensee, not an invitee. Trespasser: A trespasser is a person who enters the premises of another without an express or implied invitation, and not for any business purposes for the possessor. Where premises owners are not aware of trespassers, they typically have no obligation to warn a trespasser of any dangers or to make their premises safe for the trespasser. The possessor knew or should have known of the dangerous condition, and should have realized that it involved an unreasonable risk of harm. The possessor failed to employ reasonable care to ensure conditions were safe, or to warn the licensee or invitee of the condition and presumed risk involved. The licensee or invitee did not know of the condition and the risk. A possessor has an obligation to warn or protect an invitee or licensee from risks of harm from a condition on their premises if the risk is unreasonable, and if the possessor knows or should know of the condition, and should realize that it involves an unreasonable risk of harm. If you are injured because of an unsafe condition on someone’s property, you will have to show that you were lawfully on the property, the possessor of the property was negligent in dealing with an unsafe condition, and that the possessor’s negligence caused your injury. If you or a loved one has been injured and would like to pursue a premises liability case, please contact the knowledgeable Florida personal injury attorneys at Friedman, Rodman & Frank toll-free for a free consultation at (877) 448-8585.